I’m writing this review sitting at a horrible little Mexican restaurant at BWI with a Blue Moon after having just moved out of my apartment of five months. As I consider the next steps of my life, thoughts of the neighborhood I am leaving cross my mind and I start to reconsider plans to move to the more convenient Northern Virginia. There are a few things that pull me back to the U Street Corridor: the gin-thyme-violet drink and bacon wrapped oysters at Pearl Dive, the avocado essence and caraway seed liqueur martini at The Gibson, the wonderful goat-harissa sandwich at G Sandwich Shop. Yet another addition was made, not long ago, to the list of those happy-places in Logan Circle that would be difficult to leave behind and that was Garden District. I had walked by this place countless times on my way to Estadio or El Centro or Birch and Barley and I had seen groups of people with massive steins of brew sitting at communal benches under sunbrellas having a good time. 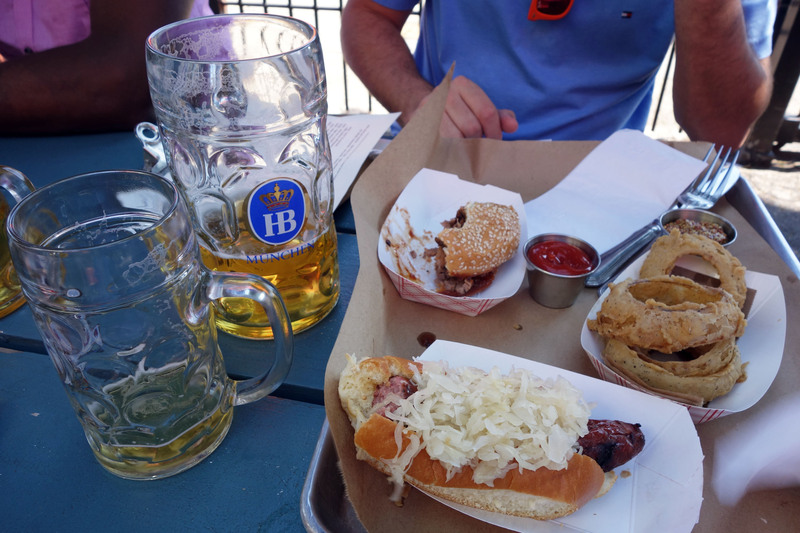 I’ve always been tempted to suggest it as a place to meet with friends after work, but have always been halted by one fear: good beer, good times, horrible food – an Americanized biergarten. This all changed last week. Strolling down 14th on a beautiful, sunny day with my new favorite dinner companion, we crossed this place and spotted a man outside the entrance tossing donuts into a frier in front of a pretty large group of hungry-looking onlookers. 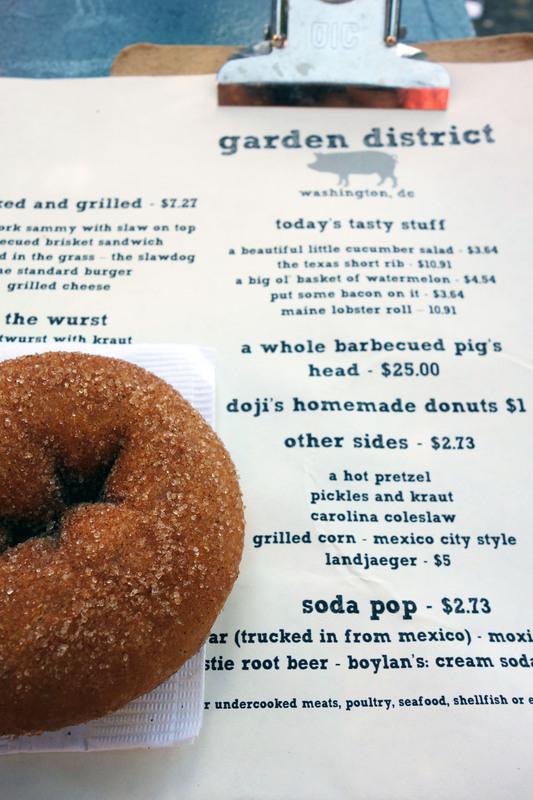 This got to me, and telling myself “It’s time,” I turned to my companion and asked, “A beer?” The place had eluded me long enough and curb-side cinnamon-sugar donuts were an indication – the place had to have something cool going on…. It does. Pan-(North) American barbecue and trimmings, Bavarian wursts, beloved fried sides and some Mexican street snacks make up the menu. Various shades of German and American beer flow freely into liter mugs. A whole pig head is smoked and barbecued in house, along with the more sane meat sandies. Some soda pop is trucked in directly from Mexico. There’s something called landjaeger which I’ve never even heard of before. And there are fresh cinnamon-sugar donuts. The place is cool in the original, simple sense of that word. The donut was all that I was hoping it would be. Made by a dude name Doji who hangs out on Thursday-Sunday afternoons, apparently pulling at the heartstrings of passersby until they decide to come in for a bier and berliner. Worked on me. Doji’s Donut was fantastically moist and very light, yeasty though not too doughy on the interior. If it had not been for the perfectly browned, thin fried coating wrapped around it, the insides would’ve reminded me of a buttery coffee cake or perhaps even a poundcake more-so than a cake style donut. Nothing dry and I’m not being generous – nothing dry about this guy. The cinnamon sugar crust bedazzling the outside of this little gem added even more to the experience of biting into it. The warm spice wrapped my tongue in an autumnal embrace, while the bits of crunchy crystal sugar livened up the experience. 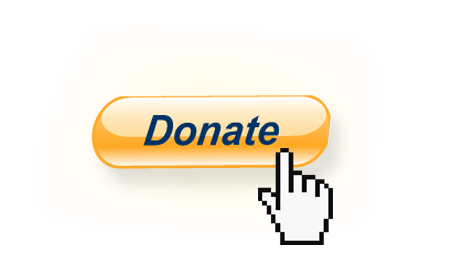 It’s small enough not to feel bad about not sharing one and it’s only one dollar. Sorry Boston, but I’m never going to a D.C. Dunkie’s on a Sunday again. When I first ordered my Bauernwurst and our server warned me that it would explode when bitten into (mind those around you! – fortunately my companion didn’t seem to scare too easily) I knew it was the right one for me. 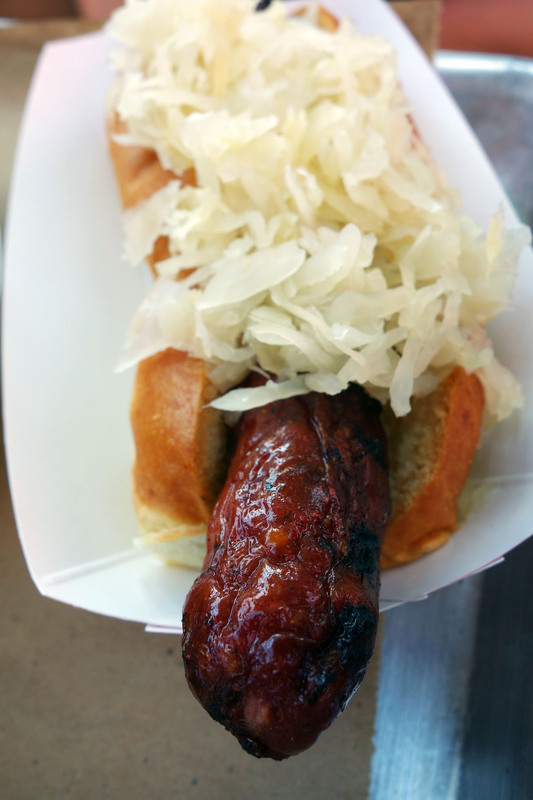 The Wurst menu includes a Brat, a Knack and this thing, described as “juicy with mustard seeds.” The sausage comes on a simple, lightly toasted, slightly sweet fluffy bun topped with a heaping mound of sauerkraut. It does burst wonderfully when bitten into, the tightly stretched, completely natural casing splitting under the incisors to let out a gush of perfectly seasoned, wonderfully salty and smokey meat juice onto the tongue. The texture follows, a perfectly succulent blend of beef and pork with specks of bright, zingy mustard seed spotting it here and there. The bread soaks up the juice [though there is very little excess grease] and is well proportioned to the sausage. The cool, tangy-sweet sauerkraut wakes up the taste buds, contrasting against the smokey, salty, warm tube of meat perfectly and happily pop-drop-and-locking with the mustard seeds peeking out from the latter. 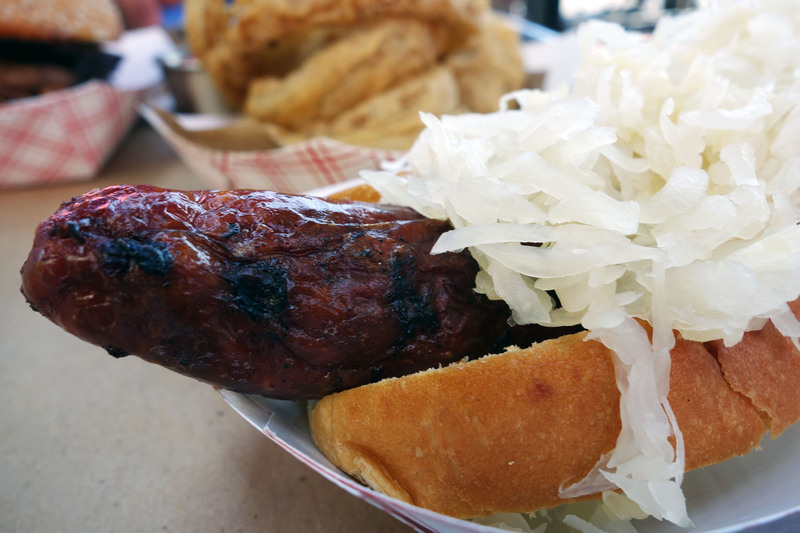 There was a tad too much kraut on my wurst so I scraped some of it off to better taste the intricacies of the meat, but then ate this excess with my O’rings shortly after. It’s all good. 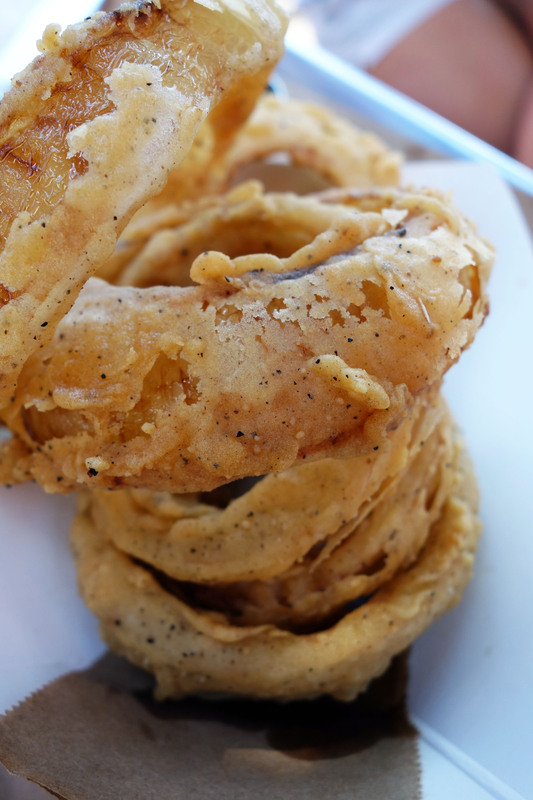 And by O’rings I mean GD’s Buttermilk Onion Rings, which are among the most picturesque looking fried sides in the city. They were a joy to photograph, especially when I got the go from my dining companion to take my time in doing so. Thin, flaky, pepper-speckled buttermilk batter, perfectly caramelized onion peeping through it’s cracks. A wonderful crunch followed by an equally satisfying buttery softness from the vegetable. The dish kept it wirklich [that’s German for “real”] by coming with whole grain mustard spread on. I liked the idea, as this is certain not the right place for a truffle oil [yuck] or ginger-yuzu dipping sauces, though I wish that a tiny bit of something creamy had been incorporated into the mustard to make it a bit easier to spread, as the mustard seeds did not grip the coating strongly enough and rolled off onto the plate. 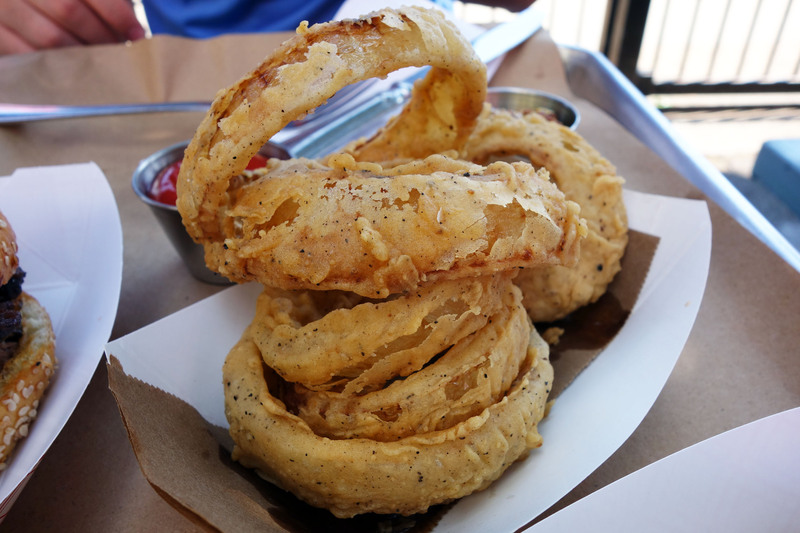 But maybe that’s just my slothish American side talking – maybe there’s nothing wrong with a bit of rugged mustard seed on an otherwise very delicate onion ring. This dish was especially important to me as I recently had a pretty lousy fried pickle experience in Charlottesville and had temporarily lost my faith in fried stuff. These rings made me a believer again – it can be done right, with care and attention. 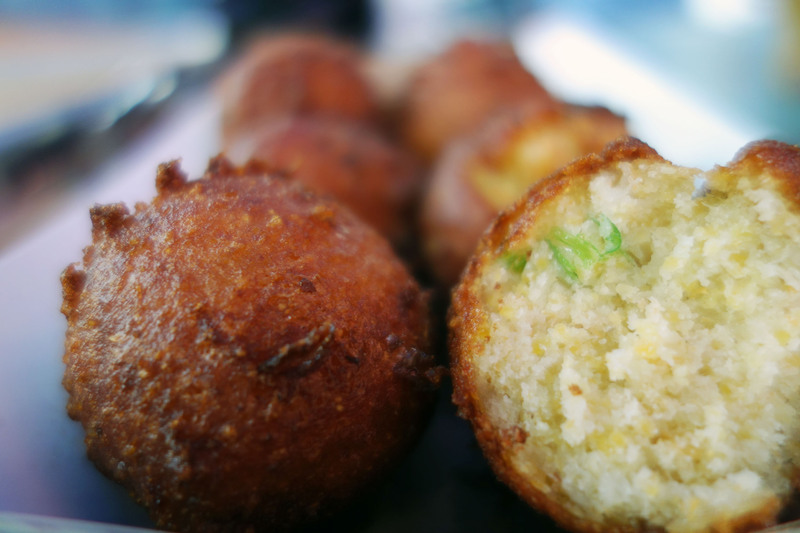 A perfect complement to the liters of lager are the Hushpuppies which soak up all that liquid nicely without being too filling. They’re also easy to split with friends. 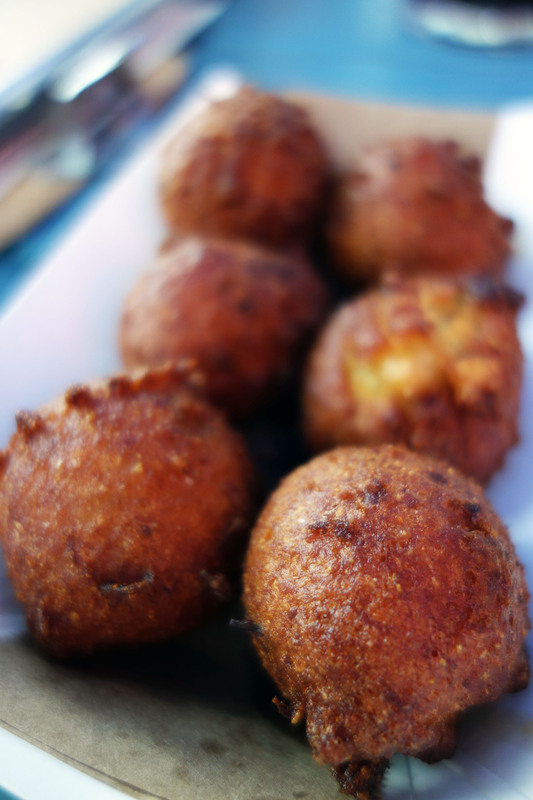 The little balls of cornmeal get golden brown and very crunchy on the outside, like the exterior of a corn dog but grittier in texture. The inside keeps a great balance between smooth and gritty, slightly creamy though maintaining the crunch of individual bits of corn. The spring onions give it a beautifully delicate color and a surprising layer of flavor, a zing to offset the natural sweetness of the corn. These are served straight-up without a sauce as they are meant to be a side to the BBQ and thus designed to take on the flavors of the latter. They also work great alone as a snack to soak up all the wheaty beer. When my beer companion looked up from the menu with a silence that begged suggestions, I vaguely mused that brisket can sometimes be good, but then quickly took it back, remembered all the dry, chewy brisket I have had in the past. “Best to get this only in a BBQ join designated as such,” I thought. “Or maybe just get the burger,” I said. The idea has already stuck with him, though, and he went for the brisket. If he hadn’t, I would’ve never known that Garden District happens to have the best Brisket Sandwich I’ve ever had in my life. This seems like an exaggeration but it isn’t. Part of that has to do with the fact that being from Boston and having only recently had my first few tastes of the South I really haven’t had too much experience with American BBQ, let alone Texas-style. Part of it has to do with the fact that it was just that good. 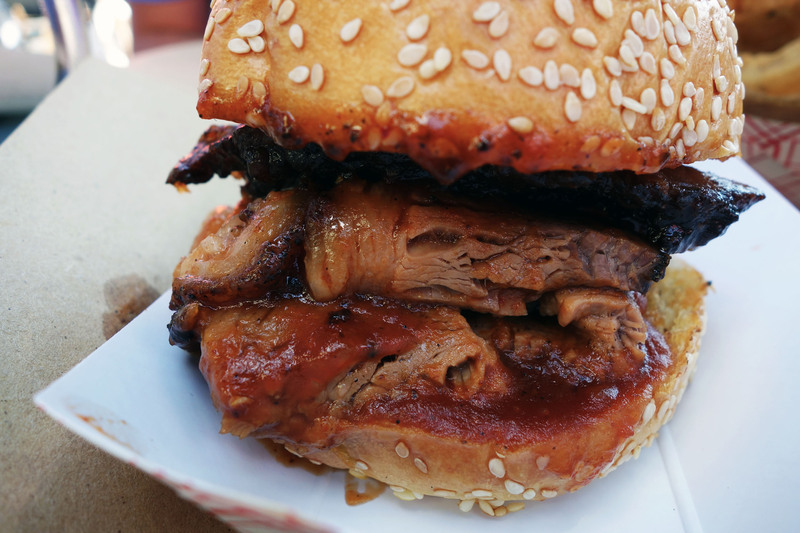 The meat, smoked in-house, was unbelievably juicy, moist, succulent – all those synonyms are worth listing to describe it. Some glossy, fatty bits were mixed in with meatier ones, some burnt ended bits added a hint of smokey char to the mix of flavors. The tomato-based BBQ sauce slathered over it was delicious, sweet and acidic and leaving plenty of room for the powerful smokiness of the beef. Small enough to not keel over after but eyes-closed satisfying from start to finish. 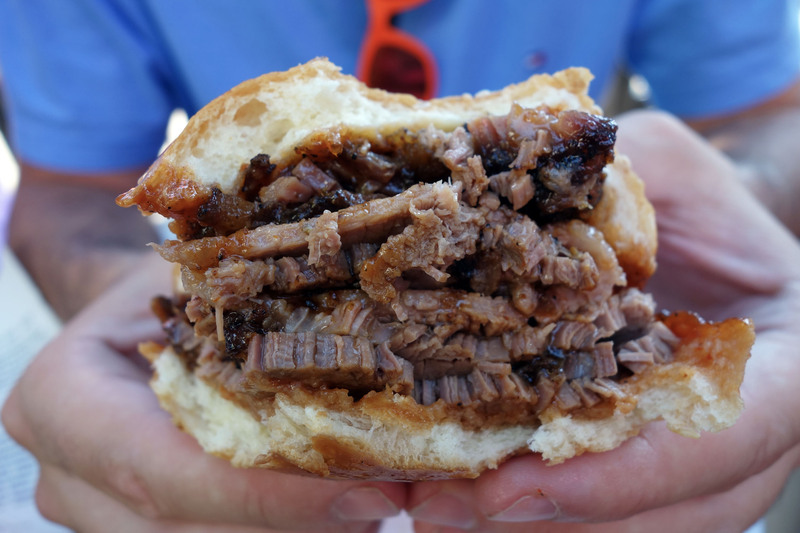 A very close second to the show-stopping brisket is the Pulled Pork Sandwich, prepared in the North Carolina style with a vinegar base and a delicate smoke. A fluffy, though not particularly gourmet bun dotted with sesame seeds soaks up the contents inside without becoming too soggy on the bottom. Juicy and very moist shreds of flavorful pork top the bread, almost rillette-like in consistency; squeezing the stuff up to the roof of my mouth resulted in a flood of delicious meat juice (mixed with a very light amount of barbecue sauce) into my mouth. 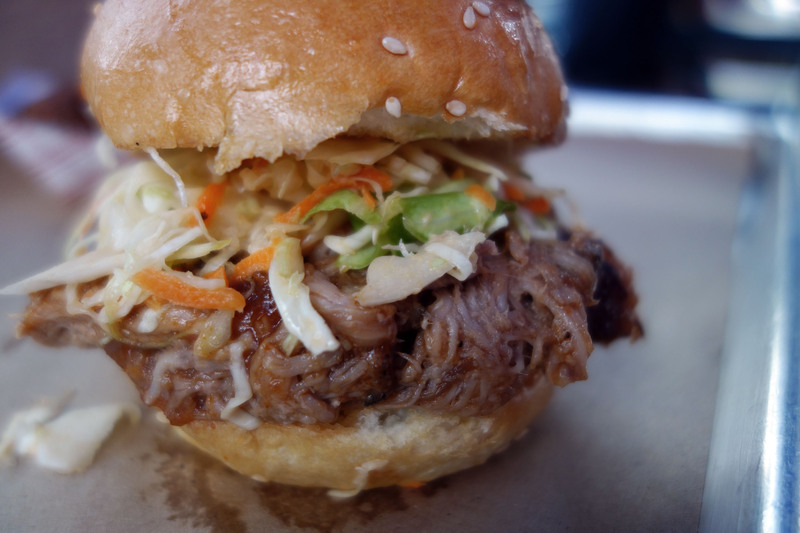 Topping the meat is the perfect relative amount of crispy, vinegar-based cole slaw. 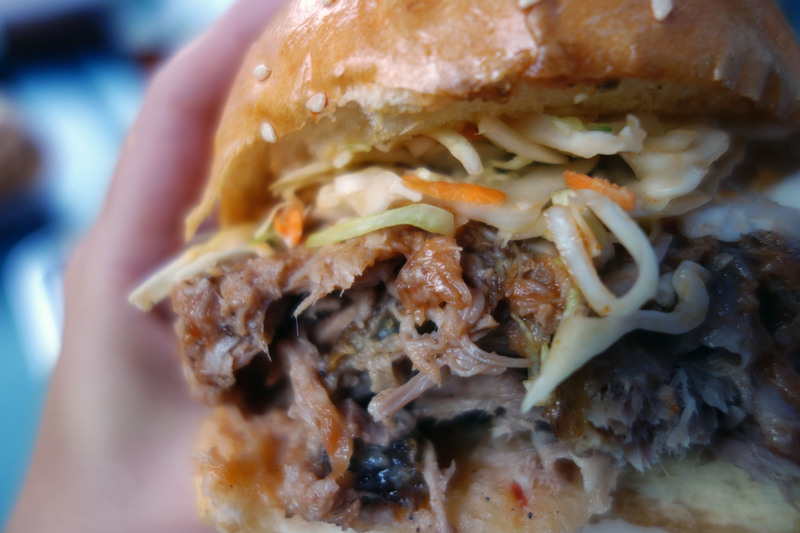 No mayo to weigh anything down and overpower the gentle flavors of the pork. Although I’ve heard complaints about the size of the sandwich, I actually think it’s perfect. It’s petite, sure, but packed with meat. It was the perfect amount for me to actually finish without feeling too weighed down but very satisfied with the ratio of tender, delicious meat to everything else. I still prefer the brisket but this one is another great choice and I was again pleasantly surprised by the quality. 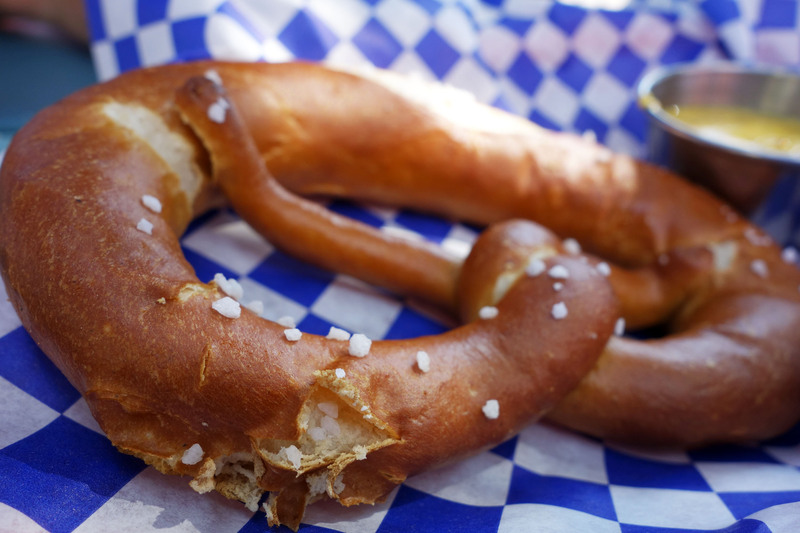 To pair with what was left of his ginormous jug of Hofbrau, my dining companion also ordered one of their Pretzels. It came to the table notably late, which told me that it had been freshly baked even before I bit into the warm, doughy soft thing. Much like a solid version of the yeasty lager we were drinking, the pretzel was the perfect accompaniment to the latter. The outer surface was nicely browned with crunchy little specks of kosher salt, while the inside was chewy and delicate. A bit daintier and skinner than the pretzels I had in Germany, but still very nice and enough to share. Delightfully tart, creamy mustard ideal for dipping on the side. Proprietors Tad Curtz and David Rosner gained an appreciation for the warm, breezy spring afternoons of D.C. after moving there from the frigid Northeast. I can relate. 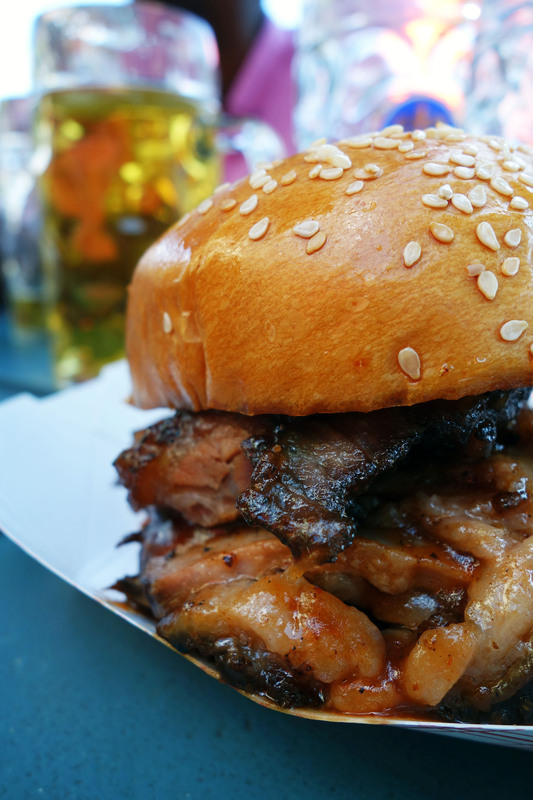 They decide to combine the backyard BBQ traditions of their childhood with the experience of a Bavarian biergarten, both in the menu and the decor. The result is an easy breezy spot with a laid-back vibe, some great German beers flowing from tap and some damn good eats to soak it all up with. Truly a neighborhood favorite. 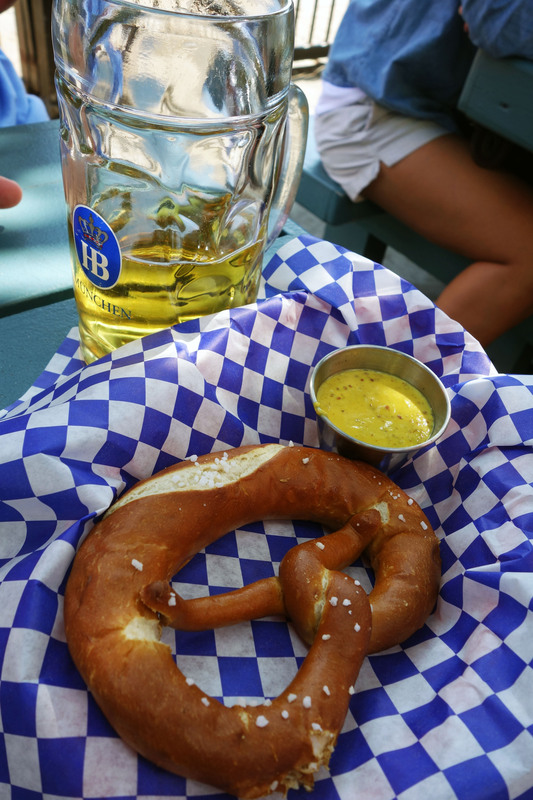 Prost to summertime in Logan Circle! Even if not as a resident, I will be back for more beer-side treats soon! August 12, 2013 in WASHINGTON D.C..